Everyone uses wood products. Lumber is used to build our homes, we read from and write on paper, many of our other goods are shipped inside cardboard boxes and stacked on wooden pallets. And all of that wood needs to come from somewhere. So we at Sunshine Saved have decided that at least a bit of this stream of wood products would come from our own farm. With good planning, our farm can sustainably produce a steady supply of wood without compromising the health and integrity of the ecosystems found here. Logging was by far the single biggest economic driver during the settling of the region of the Farm at Manitou Bay, as it was in many parts of North America. Ottawa, the nearest large city and capital of Canada, began as a logging town. Ottawa was situated at the Chaudiere waterfall on the Ottawa River so as to take advantage of all of the hydropower available there, which was used to cut logs that were floated down the rivers along with other industry. Our own farm lies on the Gatineau River, which flows right into the city of Ottawa, and our area was first logged in the mid to latter part of the 1800s. Everything about our local region has been shaped by logging, down to the location of the villages up and down the Gatineau River. There is a small village every 8 to 10 miles, spaced just at the distance that a horse-drawn sleigh could move per day in the winter, with a small hotel and stable springing up at each camp that later developed into a village of its own. While I don’t have a complete history of our actual property, a look through the history of the region and the tell-tale signs left behind in our woods tell much of the story. 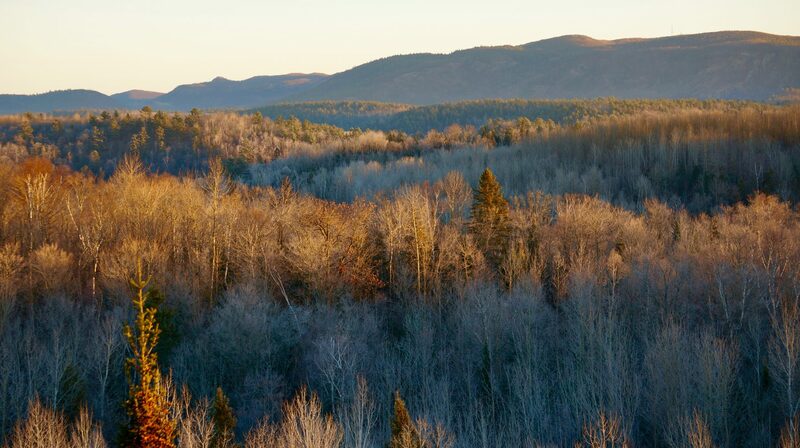 Before the arrival of Europeans, our property was heavily forested, mostly old-growth of species like white pine, hemlock, sugar maple, basswood, white spruce and red oak. On the first pass of logging in the mid 1800s, loggers took only the large white pines. These trees make for great construction lumber and were also a favorite for ship masts, with the trees growing to four feet across and as much as 150′ tall. Only the pines were cut at first, in part because these trees could be floated down the river and be brought to market; all of the maple and oak were so dense that they would sink. Starting at the end of the nineteenth century, softwoods like spruce were sent down the rivers to be made into pulp and paper. The arrival of the railway and logging trucks after the turn of the century opened up the possibilities of cutting some of the denser hardwoods. Following these successive waves of cutting, there were many openings and clearings left behind, and these areas filled in with what is called ‘secondary’ forest, made up of a greater variety of species, including those that need much more sunlight like aspens, white birch, and black cherry. Our property today is a relatively mature secondary forest. Secondary forests similar to ours abound today throughout the northern US states and eastern Canada, from Minnesota east to the ocean. Along with these bigger logging operations, our property has been farmed since the 1870s, and every farmer throughout the region has used their woodlots to provide a steady supply of wood to build and heat their homes, barns, and workshops. We know that our property was commercially cut at least once more in 2008, harvesting some of the fast growing and sun-loving trees like aspen, as many of these trees were nearing the end of their roughly 100 year lifespans. Our forest is now in the process of moving very slowly back towards an old growth condition more similar to what came before the waves of logging. In eastern forests like ours, it is usually best practice to do what is called selective cutting (for more information see here and here). In a regime like this, one cuts only a modest portion of the trees at any given time, while leaving the rest to grow and fill into the gaps left by those that are removed. This can preserve a relatively natural looking landscape and maintains much of the wildlife, understory, and ecological relationships of an unmanaged forest. Done properly, one cuts out those trees that are sick, weak, or poorly formed, as well as some of the ‘good’ trees, while leaving some healthy trees of all sizes. This allows the straightest and healthiest trees to grow with relatively little competition. Unfortunately many loggers, if left to their own means, ‘high-grade’ when they do selective cuts. This means that they take only the most valuable trees while ignoring the rest, which can leave a forest without good growing stock for decades to follow. A well managed selective cut can take up to 1/3 of the trees at a time, and can be repeated approximately every 15-20 years in perpetuity. This means that one is then harvesting 15 years worth of growth and energy on each pass through the forest. One could just as easily cut less trees more often, which homesteaders and farmers often do, but for commercial logging the amount of heavy equipment used necessitates doing much bigger harvests to justify bringing in the equipment. Our own property has most likely been cut in successive ‘high-grade’ cuts, where loggers went through and took mostly the best, while leaving the rest. The forest still holds promise, but is not what it could have been had it been better managed. Clear cutting is another, and often much more vilified, approach to logging. In clear cutting, loggers go through and remove every tree, or at least every tree worth harvesting. While this can be a reasonable thing to do in certain situations and areas, clearcuts require many decades before the forests can recover, and if one wants to encourage slower growing species like oak and maple it can take longer yet. In the early years after clearcutting, there is such a profusion of young trees that they end up wasting much of their energy in competing with each other, rather than turning that energy into growth. On the flipside, this is a tremendously efficient way to harvest. One can collect all the accumulated energy of decades worth of growth, and loggers don’t need to be careful about working around any trees that are to be left behind. Here at the Farm at Manitou Bay we are doing highly selective cuts based on our management plan, and only at times of the year when impacts on the soil, flora and fauna are lowest, such as the drier parts of the autumn as well as during the winter months.